I think I had already made up my mind about the fabric I would use for the dress as soon as I saw the pattern, but it's always nice to umm and ahh and try on different options in your head before settling on one (or more if you fancy!). 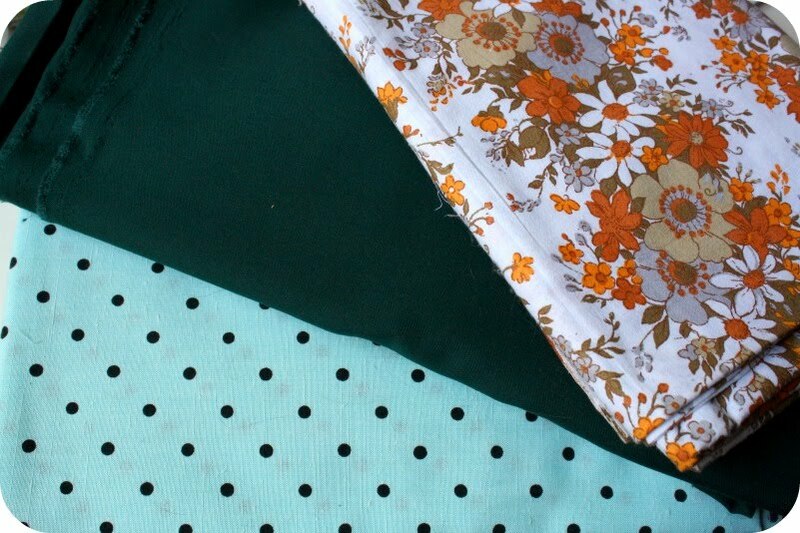 I love the blue and black polka dot vintage cotton, but haven't found the perfect pattern for it yet, and the 'autumnal' coloured fabric is actually a vintage sheet! I've decided to use up the rest of the forest green fabric I bought for the swing dress sew along Casey did earlier in the year. I've wanted a forest green dress for sometime now, and with it being autumn, it's really the perfect time. Pleats, cap sleeves and a nice round neckline will be perfect I think. pps) Confused about what 'One Pattern, Seven bloggers' is? Go here! 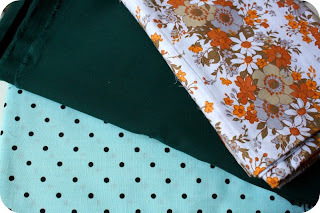 8 comments on "One Pattern, Seven Bloggers - 2"
I love the blue fabric with the black dots! I couldn't find the forest fabric you're talking about, do you have a link to it? A pleated skirt too! I've not done one, so I'm excited to see how yours turns out, and how you do it! Nice fabrics! I can't believe you are going to Vancouver. That will be so awesome!!! Can't wait to hear all about it. vintage sheets are fantastic for sewing..
Hey! I love the vintage sheet, always my face thrifted fabrics to use! It wasn't the best pattern, in my opinion, as I pretty much had to alter everything to get a normal fit, but as you can see still the neckline is really plunging. Now it may have been because I'm petite sized and didn't add the seam allowances, so just take it slow and maybe try the bodice on different fabric first (like a toile or muslin)! Good luck babes, I bet it'll look fabulous! I like pattern with flowers for this dress or maybe blue and black polka dot vintage cotton.